Enjoy intuitive manoeuvrability and an impressively rapid work-rate with this feature-packed lawn-tractor from venerable UK-brand Mountfield. Driving it is a purpose-built Mountfield 7750 engine that has a large 452cc cylinder-displacement producing an impressive 11.2hp @ 2800rpm; and which features Mountfield’s overhead-valve (OHV) technology that works to cut fuel-consumption, noise and polluting exhaust-emissions. A six-litre fuel-tank will see you cover lots of ground between top-up stops; while an electric key starter makes the ignition process super-simple. The Mountfield 1538H Lawn Tractor boasts a hydrostatic transmission that delivers infinitely variable foot-pedal controlled ground-speed adjustment, thereby making it easy to negotiate corners and to execute end-of-pass turns (a turning-radius of only 140cm contributes further to manoeuvrability). It features an electromagnetic P.T.O. for smooth, low-wear blade engagement; and it offers single-lever, spring-assisted height-of-cut control, so the pre-mowing set-up process couldn’t quicker or easier. For the first time ever, a lawn tractor with an 84 centimetre cutting width features twin blades, a radical inclusion offering an even smoother, more efficient cut for large lawns and competition beating performance all round at a highly affordable price. Designed with fresh, smooth lines and an easy step through shape for problem free mounting and dismounting, the Mountfield 1530M Lawn Tractor delivers true innovation and value for money with its cleverly designed, non-overlapping cutting system, non-timed to avoid serious damage if an obstacle is encountered but still producing a smooth and even cut every time and delivering unrivalled collection in dry or wet conditions. The cutting deck also provides plenty of mowing versatility with a seven-position cutting height adjustment ranging from a precise 25mm for a very smart, clean finish to 80mm for longer and rougher grass. The airflow created by the blades contributes greatly to the grass collection, unrivalled in a machine in this price range. Another great feature, rarely found on tractors in this class, is the grass collector full indicator. When the collector is full an audio alarm – a loud beeper – alerts the driver so no having to continually turn around to check the level. If you’re running a larger walk-behind mower that’s just not covering the ground fast enough, this agile little ride-on from British brand Mountfield is the ideal alternative. Under the driver’s seat is a Mountfield 7250 engine; a four-stroke unit that has a high-capacity 414cc cylinder-displacement; and which benefits from Mountfield’s noise-, emission- and fuel-cost-reducing overhead-valve technology. An electric key starter means achieving ignition couldn’t be easier; while a high-volume four-litre fuel-tank will see you complete the jobs without many tiresome, time-consuming interruptions. 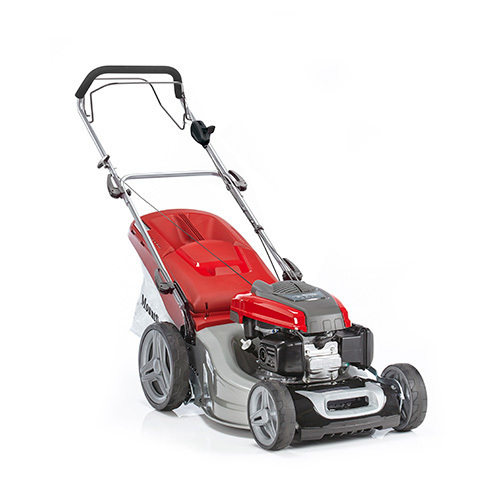 Supremely flexible-in-use, the Mountfield 1328H Ride-On Lawnmower offers seven preset heights-of-cut and can either mulch clippings, where they’re returned to the lawn surface to rot down*; or bag them in the extra-roomy 170-litre catcher (a ‘bag full’ buzzer will sound when you’re at capacity, thereby avoiding blockages and mess). 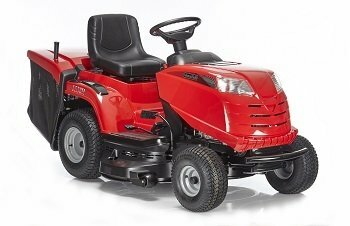 A groundbreaking and very exciting breakthrough in lawn tractor design, the Mountfield 1530H is the only 84cm cutting width tractor to feature twin-blade cutting action, and is an innovative, stylish, and performance machine at a remarkably affordable price, offering unrivalled collection, compact ergonomic design, comfort and cutting efficiency. 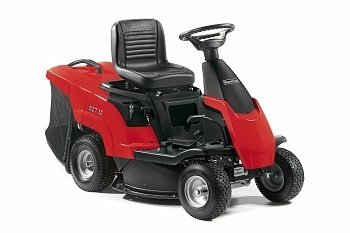 Designed to cut on larger lawns the 1530H features a hydrostatic drive, delivering precise and detailed, unlimited control over acceleration and deceleration, both forward and reverse, without clutching or gear changing up and down, to help negotiate obstacles and cut right up to edges, borders or walls, the tightest steering and handling available. 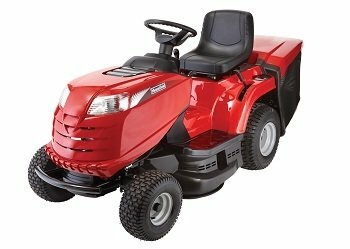 The tractor is powered by a powerful Mountfield 7750 452cc series engine, which delivers 8.4kw (2800rpm) of power to deck and wheels and ensures a dependable, quiet and smooth performance. This is achieved by careful and expert engine design, researched for over ten years. Bearings are used on all of the spinning surfaces within the engine, with an internal oil pump ensuring that the engine is lubricated throughout without relying on oil being splashed around. The piston moves in a cast iron liner and the crankshaft is balanced to reduce vibration. Over ten years of research has gone into this engine and it shows. The six-litre fuel tank speeds up working by ensuring longer sessions with less refuelling.